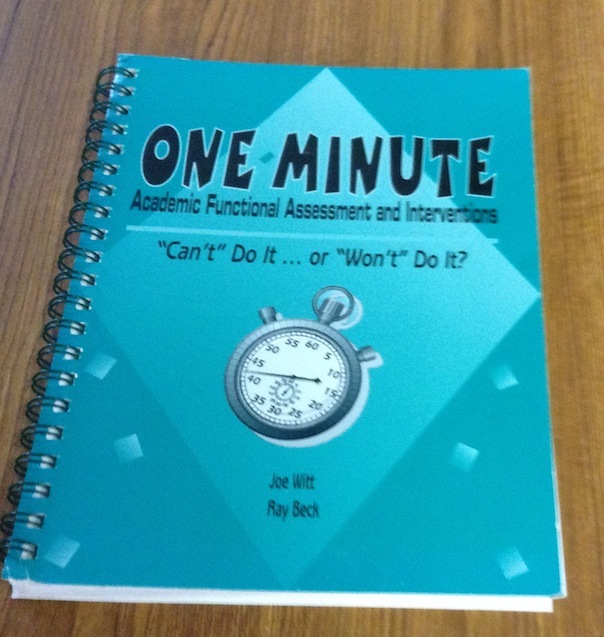 Complete title: One-Minute Academic Functional Assessment and Interventions by Joe Witt and Ray Beck. Presents assessment procedure designed to help teacher determine if the student "Can't do it" or Won't do it." Chapter 1 contains procedures for discovering which of the most common reasons progress is hampered. Chapter 2 provides a review of how to use Precision Teaching, a tool which is essential to the One-Minute Functional Assessment. Chapter 3 describes procedures for conducting the One-Minute Functional Assessment. Chapters 4-6 describe specific intervention procedures to meet the child's needs.